I've made a lot of stink in the past year about Pernod and their misinformation campaign, but there are other brands that have been just as difficult to deal with, if not moreso, and whose advertizing campaigns have proven detrimental to the idea of informing today's absinthe consumer. Case in point: Crillon Importers. Their products include Absente, Grande Absente, Absinthe Ordinaire and now Michel P. Roux Supreme Absinthe. I had my first dealings with Crillon a few years ago when they sent me a bottle of Grande Absente to review. The product itself was billed as an authentic 18th century recipe; one that included grande wormwood, thus qualifying it as real absinthe. Well, suffice it to say, the product itself was middle of the road, at best: harsh star anise flavor and artificially colored. The spokesman I talked with over the phone was surprised to hear I didn't find it great, which should have told me something. Over the next two years or so, I'd run across some of their marketing, which was for the most part, misleading and/or incorrect, but I didn't think much of it, since it didn't seem to be a very popular brand in the U.S. While surfing around on Facebook, I ran across a new fan page called 'Absinthe - The Green Movement'. While it seems to be putting itself out there as an absinthe resource, it is in fact run by Crillon as a main page for all four of their brands. Due to their marketing ventures, the page has quickly garnered more than 8,000 members, which in my estimation is more than any other absinthe brand. A shame to say the least. As I began to read through a lot of the posts made by the brand reps, I couldn't believe my eyes. A large amount of what they were posting was blatantly false and/or misleading. I reluctantly 'liked' the page, solely to enable me to comment on their posts, and correct some of the information. Well, let's just say they didn't like that too much. They got defensive quite quickly, and within a week or so, suspended my priveleges to post, and erased my comments. Apparently, they prefer censorship to true education. Because of the huge following the page now has, I felt it was important for me to call them out on a lot of their statements. So that's what this post will be about. I'm going to break it down into several sections: Brand, Irresponsible representation, Absinthe History, and the dreaded Thujone. 1) In one advertisement, they claimed that their brands are the best selling brands in France and Switzerland. Well, since we know that Switzerland has a law that prohibits artificially colored absinthes from being sold in their country, we know for a fact that their claim cannot be true, since all three of their original brands are all artificially colored. 2) In multiple ads and FB posts, their representatives claimed that their brands were now being made with Northern Wormwood, which they claim make it authentic. There are two possibilities here: 1) The reps are so uneducated that they don't know that Northern Wormwood is not the same thing as Grande Wormwood, or 2)They aren't really using Grande Wormwood and they accidentally tipped their hats. My guess is the former, but unless we are able to examine their herbs, we'll never know. 1) On their flikr page, they featured a bar which lights their absinthe on fire, then had the patron first huff the fumes, then down the shot. As I mentioned there, the brand might have a legal battle on their hands when someone burns their mucous membranes by inhaling strong, hot alcohol vapors. Shortly after the exchange, all of the comments were removed, apparently after they realized what they were endorsing. 2) They claim that Absente was the first absinthe available in the U.S. market since 1912, and was available years before any other brand. This is misleading because the original Absente did not contain wormwood (the herb that gives absinthe its name), thus can't be considered real absinthe by any rational argument. 3) They claim that their product comes closer to original absinthe recipes than the majority of products made in the U.S. or Europe. Yet, on their Absente page, they also claim that they don't know what absinthe tasted like back in 1915. Try as I might, I can't figure out how both statements can be true simultaneously. during the height of absinthe's popularity in France, there was a identity standard, which regarded artificially colored absinthes as lower in quality than naturally colored products. Thus, they cannot be the 'highest quality'. Same ingredients. We know that FD&C Blue wasn't created until 1896, and FD&C Yellow #5 not until 1949. So we know they aren't adhering to the same ingredients used in the mid 1800's. I won't even go into the whole use of the term 'artisinal'. Here is where I feel the most irritated. Mainly because they claim to be educating the public, but in reality, they are being complacent in leading consumers to believe that thujone is an important part of absinthe. I think they believe that if they truly make an effort to play down the importance of thujone, they will lose customers who are buying absinthe strictly because they think thujone is a drug or has some recreational potential. Instead of telling the truth, which means letting people know that the legal limits of 10mg.l in the US and 35mg/l (for bitters) in the EU essentially means thujone free, i.e. NO THUJONE, they instead use their best marketing speak to say they contain the MAXIMUM amount allowed by law. While what they are saying is most definitely true, it also reenforces the belief that more thujone is desirable. If they were truly interested in educating the public they could simply reference the recent studies that show that pre-ban absinthes, for the most part, didn't contain much thujone, contrary to previous assumptions. But I think that might be just too much work for them. I think they'd prefer to retain those potential customers by luring them in with MAXIMUM thujone amounts. So, in conclusion, looking at the facts, one can only conclude that Crillon and their brands care more for extravagant marketing than they do about creating a superior product. Why is it that so many of the firms that have the most available capital tend to skimp on the product? If Crillon had any sense about them, they'd hire someone who actually has a large amount of experience with absinthe and its history to work with their marketing department. I've been a fan of Tesseron cognacs for quite some time, but they have remained in relative obscurity until a few months ago. At least in the circles I run in. Thanks to David Nathan-Maister at Finest and Rarest, some light has been shed on the brand. So much so, that I thought I'd go out and replenish my supply and do some reviews. A big shout out to Joe Riley at Ace Beverage in Washington DC, who had a good selection from the line. Cognac Tesseron is one of the great secrets of Cognac. Abel Tesseron created the company in 1905, relying at the time on two separate estates, one situated in the Grande Champagne area (Boneuil) and the other in Petite Champagne (Saint-Surin). He adopted a long term policy of buying up stocks of the oldest and finest eaux-de-vie, carefully conserved in a twelfth century crypt. Despite a very low public profile, this little known firm is today revered in the region, as owners of the largest stocks of great old cognac in existence. In their legendary innermost cellar or paradis, lie an incredible 2200 glass demijohns (most around 25 litres) of cognac dating from between 1825 and 1906, painstakingly built up by three generations of the Tesseron family. This treasure trove of 19th century cognac is supplemented by hundreds of oak casks of the very finest cognac dating from the first half of the 20th century. 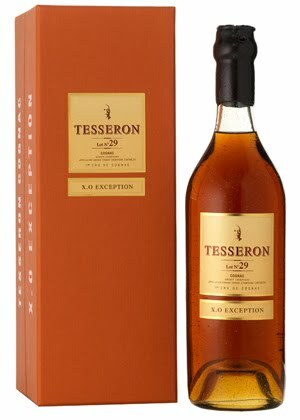 There is no comparable collection in Cognac or anywhere else - the Tesseron holdings are unique, and irreplaceable. Lot 90 'Selection': aromas of pears, membrillo, maple and soda bread. Taste is young, with leather, honey and dried fruits. A great ever day cognac. Good for Earthquake cocktails too. Lot 76 'Tradition': Only made from Grande Champagne cognacs. A deeper and richer color than the 90. The aroma is also more delicate. Tea and mulled fruits. Flavor is citrusy with a noticeable rancio from the aging. The grape base is quite evident. Very smooth finish. Lot 65 'Emotion': A special gift decanter edition. Nose of plums, leather and nougat. Flavors consist of tobacco, nuts, honey and baking spices. A dash of water brings out wonderful dark chocolate notes both in the nose and the flavor. Lot 53 'Perfection': Absolutely gorgeous topaz/copper color. Deep and exotic. Lots of chocolate and old books on the nose. Figs as well. The flavor and texture is thicker and spicier than the younger line. Lots of dark chocolate and white pepper. Fantastic stuff. Lot 29 'Exception': The only cognac to ever score a perfect 100 from Robert Parker. I can see why. This is exceptional cognac. Lots of leather, chocolate, oak and even cherries on the nose. The flavor is full of the same, along with a wonderful rancio (organic, earthy, mushroomy, umami type of aroma and flavor indicative of aged eau de vies). Spectacular. As many of you know, I'm a huge fan of gin. Not only is it a staple for creating many of the best cocktails, but it also works so well just splashed with some club soda or, more widely, with tonic water. And where would the martini be without gin? Yes people, martinis are made with gin, not vodka! In any case, as gin has grown in popularity due to the cocktail renaissance, more and more brands are being discovered on local shelves. With that in mind, I decided to put together a list of 10 that you'll commonly find in the DC area. My hopes are to give you a good idea of how you can use many of them, since the flavor spectrum is quite wide-ranging. In the next few weeks, I hope to add another 10 or so, including some of the more household names, like Tanqueray, Bombay and Beefeater. But since those already probably have a place in your bar, I wanted to give you some info on brands you might be considering adding. Keep in mind, this is only one man's (my) opinion on each of the brands and what suits my palate best, but I though it might be interesting for those of you who like gin. Best for: Any cocktail calling for a good gin. Works equally well in sweet, citrusy or savory cocktails. Best Tonic accompaniment: Fever Tree, Stirrings, Q or Fentimans. Taste: Minty and a bit on the savory side due to the orris. Light flavors of peppermint, Pumello and anise. Best for: Cocktails that call for gin as well as a darker spirit such as a whiskey. Also for gin cocktails that call for Chartreuse. Good G&T also. Best Tonic accompaniment: Not recommended for G&Ts, because it gets overwhelmed by the tonic, but if pressed, I’d recommend Schweppes. Best for: Most gin cocktails will work well, but citrus ones especially. Taste: bright and refreshing with hints of juniper, white pepper and lavender. Cucumber as well, of course. Best for: Artisinal cocktails. Especially those calling for tea, vegetal or savory ingredients. Nose: cloves and mint. LOTS of vanilla. Taste: Extremely sweet for gin. Flavor similar to vanilla mints with hints of juniper. Similar to an Old Tom style more than a London Dry style. Best for: Sweeter cocktails that might get adversely affected by too much juniper flavor. Best Tonic accompaniment: Not recommended for G&Ts because of the sweetness, although it worked OK with Hansens. Taste: sweet and a bit chalky. Unbalanced. Best for: basic house G&Ts. Best Tonic accompaniment: Schweppes or Canada Dry. Best for: Old style cocktails; many of which used Dutch style gins. Best Tonic accompaniment: I don’t recommend this style of gin for G&Ts. Nose: extremely light. Not much discernible.